Note to all visitors: please READ THE DESCRIPTION OF THE EARTHCACHE ACCESS if you are not using funicular - (kindly) ask funicular operator to allow you a visit to fossil exhibition! (SI) Gradnja tirne vzpenjače je razkrila skrivnosti geološke zgodovine Grajskega hriba. 1. Zakaj so fosili tako zelo pomembni za geologe? Napisite vsaj en razlog. 2. Prestejte fosile razstavljene v vitrinah. Koliko jih vsebuje semena golosemenk (so precej velika, cca 3cm)? (ENG) The construction of the funicular revealed secrets of the Castle Hill geological history. 1. Why are fossils so important for geologists? Write down at least one reason. 2. Count fossils displayed inside the display cases. How many of them carry the large seed (a couple of centimeters) of Gymnosperms? 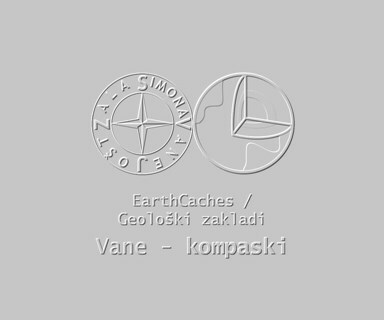 for a complete list of our EarthCaches and a lot of additional information. TAKE A WALK AND DISCOVER THE REST OF THE CASTLE TOO! ENJOY THE VIEW! Earliest written references mention Ljubljana Castle in the 12th century. So, the Castle has about 850 years of recorded history. But how old is the Castle Hill? How old are the rocks that form the hill? Once in a lifetime opportunity has been offered to geologists and paleontologists with the decision to build the funicular from the city to Castle Hill! They have grabbed the chance with delight! Numerous plants fossils have been discovered in the rock layers all along the funicular line during the construction. The site of upper funicular station, just under the Castle walls, has proved to be rich with good preserved fossils, and so the most important to paleontologists. And, now they could unlock the Castle Hill secrets and determine the age of the rocks more precisely. The discovered rocks and fossils led the geologists to ascertain that this location was once a swampy river delta in a warm and tropical climate. Ferns are the most common fossils found in the rocks of the Castle Hill. Less prominent are the first Gymnosperms, the seeds of which were able to keep for longer periods and allowed the plants to colonize non-marshy lands. Similar plants appeared in the Carboniferous throughout the unified Euro-American plant area which covered the area of North America and extended through Europe into Asia. Class Equisetatae is represented by many plants. The name comes from their jointed stems and branches, from which small leaves grew. These plants appeared 400 million years ago and reached their peak in the Carboniferous. They also included some arborescent (tree-like) plants. Some Equisetatae were up to 10 meters tall or higher in the past. Genus Calamites, for example, produced great trees of up to 18 meters of height with trunks of up to 50 centimeters of diameter. However, only horsetail (Equisetum) has survived until now. Horsetail grows up to 1 meter tall in Slovenia. Class Lycopodiatae - fern allies have a developed root, trunk and simple blade-like leaves. 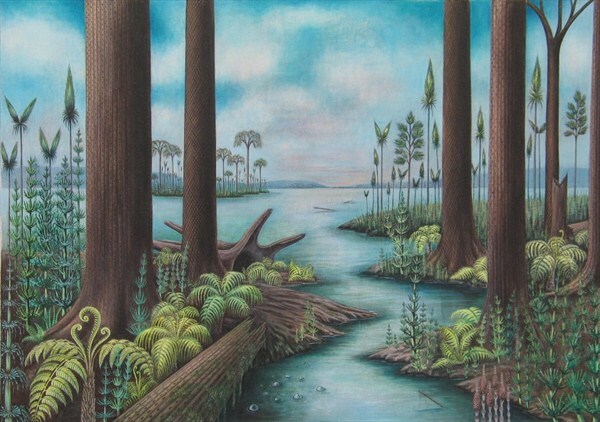 Arborescent fern allies that reached up to 30 metres have been discovered in the majority of the Carboniferous coal seams. One of them was Lepidodendron - scale tree. This genus includes plants with tall, thick trunks that rarely branched and were usually branchless at the bottom part. The surface of the trunk and the boughs has a characteristic scaly structure, composed of spirally distributed scars from fallen leaves. Today's fern allies are only tens of centimeters tall. 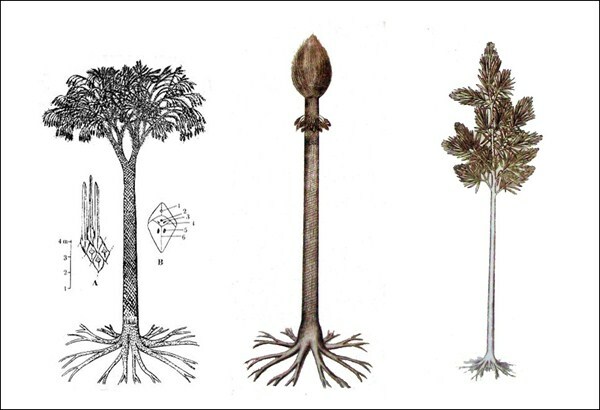 Genus Sigillaria was an arborescent plant that grew up to 20 meters, with several bifurcated branches at the top.The top of the trunk was formed by layers of blade-like leaves. When they fell off, they left characteristic scars that look like signets. Pteridosperms ranged from very small to a few meters tall. Their seeds and leaves, which looked similar to today's ferns, have frequently been preserved. Genus Cordaites include up to 20-meters tall trees with branched tops and smaller bush-like plants. The branches carried numerous long and spirally arranged leaves with extremely visible veins. Their closest living relative is probably the Gingko. Plant fossils have been dated to the Carboniferous period, more precisely, they can be attributed to the lower part of Westphalian A. In other words, those fossils have been growing plants in a tropical swamp forest about 310 million years ago! The fossiliferous rocks that form the Castle Hill and a large part of the Posavsko hribovje hills were formed in what used to be an extensive coastal delta. Paleozoic fossils sites are very rare in Slovenia, which is why they are conserved as important evidence of geological history and as part of natural heritage. When the construction of the funicular has been finished, a small but telling permanent exhibition of fossils has been put on display inside the upper funicular station. A part of original rock layers containing fossils is exposed and left “in situ” as a part of the exhibition. There is a short text description about fossil discoveries, general information about geologic conditions at the time of fossil formation and description of fossilized plants displayed. 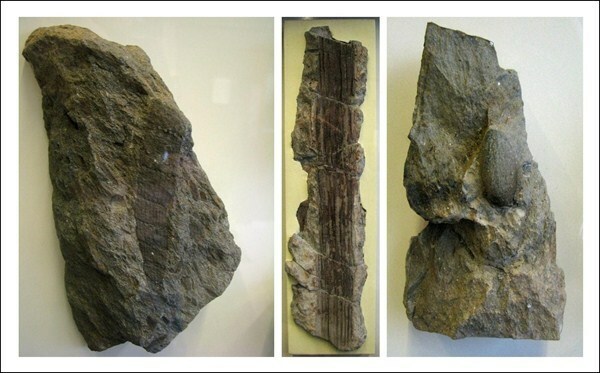 There are several rocks with fossil fragments presented in display cases. Major part of fossils found at this site is safely kept at Geological Survey of Slovenia Institute. EarthCache coordinates are set at the Castle Hill exhibition. Exhibition is set inside the upper funicular station, on the platform where passengers wait for boarding funicular before descent. If you have ticket for funicular, you can access exhibition by yourself. If you came to the Castle hill on foot or with any other mean of transport except funicular, you will have to ask funicular operator to let you to waiting platform. Funicular personnel will gladly help you, so don’t hesitate to ask. Visiting the exhibition is free of charge this way, and you don’t need to use funicular to see it. Figure 4: Calamites sachei Stur; Lepidodenron s.p. (fragment size: about 60 cm); Pteridosperma seed. za seznam vseh nasih Geoloških zakladov in mnogo dodatnih podatkov. NE POZABITE SE SPREHODITI PO GRADU! UZIVAJTE V RAZGLEDIH PO OKOLICI! Prve pisne omembe Ljubljanskega gradu segajo v zacetek 12. stoletja. Tako je zabelezenih torej kakih 850 let grajske zgodovine. Koliko pa je star Grajski hrib? Ali pa kamnine, ki ga gradijo? Geologom in paleontologom se je z odlocitvijo o gradnji tirne vzpenjace na Grad ponudila enkratna priloznost, ki so jo zgrabili z obema rokama! Med gradnjo vzpenjace, so na vec mestih vzdolz proge v skalnih plasteh odkrili stevilne rastlinske fosile. Lokacija zgornje postaje vzpenjace, tik pod grajskim obzidjem, je bila se posebej bogata z dobro ohranjenimi fosili in zato za paleontologe najpomembnejsa. Koncno so lahko razkrili del skrivnosti Grajskega hriba in bolj podrobno dolocili starost njegovih kamnin. Po najdenih kamninah in fosilih so geologi ugotovili, da je bila tu nekoc zamocvirjena recna delta v toplem in vlaznem tropskem podnebju. Od praprotnic so izkopali fosile preslicnic, lisicjacnic in praproti, od golosemenk pa fosile praproti semenk in kordaitov. Podobne rastline so se v karbonu pojavljale na enotnem evroameriskem rastlinskem obmocju, ki je zavzemalo ozemlje danasnje Severne Amerike in preko Evrope segalo se v Azijo. Preslicnice ali clenovke - Equisetatae , predstavljajo velik del izkopanih fosilov. Ime izhaja iz clenaste zgradbe stebla in vej, ki so jih obrascali ozki listici. Pojavile so se pred okoli 400 milijoni let, visek razvoja so dosegle v karbonu. Med njimi je bilo nekaj drevesastih oblik. Nekdanje preslicnice so bile visoke do 10 metrov. Calamite, na primer, so imele velika debla, visoka do 18 metrov in premera do pol metra. Do danes se je ohranil le se rod preslic (Equisetum). Danasnje preslice pri nas zrastejo do 1 m visoko. Lisicjacnice - Lycopodiatae imajo razvito korenino, steblo in enostavne ozke liste. Drevesaste lisicjacnice, visoke tudi do 30 m, so znane v vecini karbonskih premogisc. Med lisicjacnice spada tudi luskavec - Lepidodendron. V ta rod so uvrscene rastline z visokimi vilasto razvejanim deblom, ki je bilo v spodnjem delu obicajno brez vej. Na povrsini debla in vej je znacilna luskasta struktura, ki jo sestavljajo spiralno razporejene brazgotine odpadlih listov. Danasnje vrste lisicjacnic so nizke zelnate rastline visoke do nekaj deset centimetrov. Sigilarija ali pecatnikovec - Sigillaria je bilo do 20 m visoko drevo, ki je imelo le pri vrhu nekaj vilasto razraslih vej. Vrh stebla ali vej so oblikovali sopi dolgih in ozkih listov. Ko so odpadli, so v skorji pustili znacilne pecatom podobne brazgotine. Praproti semenke - Pteridospermes Od pritlikavih do nekaj metrov visokih praproti semenk so se pogosto ohranila semena in listi, ki so imeli podobno obliko kot danasnje praproti. Kordiate - Cordaites so predstavljala do 20 m visoka drevesa z razvejanimi vrhovi in manjse grmicaste rastline. Veje so nosile stevilne dolge, spiralno razporejene liste z jasno izrazenimi vzporednimi zilami. Njihov danasnji verjetno najblizji sorodnik je ginko. Fosile so uvrstili v obdobje Karbona, tocneje v spodnji Westfalij A. Z drugimi besedami, najdeni fosili so ziveli v tropskem mocvirnem gozdu pred priblizno 310 milijoni let! Kamnine s fosili, iz katerih je zgrajen Grajski hrib in velik del Posavskega hribovja, so nastajale na obsezni delti, ob izlivu reke v morje. Fosilov in njihovih nahajalisc iz starega zemeljskega veka, kamor spada tudi karbon, je v Sloveniji malo. Zato jih varujemo kot dokaze geoloske zgodovine in dragocene naravne vrednote. Po zakljucku gradnje tirne vzpenjace, so v prostoru zgornje postaje za ogled pripravili majhno, a zgovorno stalno razstavo fosilov. Manj prepereli in bolj stabilni del kamninskih plasti, v katerih so nasli veliko fosilov, je prav tako ostal ohranjen in situ v zgornji postaji. Po razstavi nas vodijo kratka besedila z opisi o odkrivanju fosilov, splosnimi informacijami o geoloskih pogojih v casu nastajanja fosilov in opisi razstavljenih fosiliziranih rastlin. V vitrinah je na ogled vec kosov kamnin s fosilnimi ostanki. Vecji del fosilov najdenih na Grajskem hribu hrani Geoloski zavod Slovenije. Koordinate Geološkega zaklada so postavljene v zgornjo postajo vzpenjace. Razstava je znotraj Zgornje postaje, na ploscadi, kjer potniki cakajo vzpenjaco za spust v dolino. Ce se nameravate nazaj v mesto spustiti z vpenjaco, lahko s pomocjo vozne karte do razstave vstopite sami. Ce ste na Grad prisli pes ali kakorkoli drugace kot z vzpenjaco, boste za dostop k razstavi morali poprositi operaterja vzpenjace. Osebje vzpenjace vam bo z veseljem pomagalo, zato se vsekakor obrnite nanje s prosnjo. Obisk razstave je na taksen nacin brezplacen – za ogled vam ni potrebno uporabiti vzpenjace. Slika 3: Geologovo igrisce; skalne plasti s fosili kot del razstave; razstava. Foto: Bogdan Jurkovsek, vane_si. Slika 4: Calamites sachei Stur; Lepidodenron s.p. (velikost fosila: okrog 60 cm); seme Pteridosperme. Photo: vane_si.